Enjoy Wine? 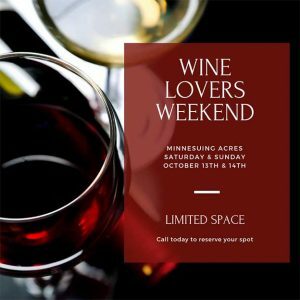 Our Wine Lovers Weekend Is For You! You Give Us Reason To Celebrate! First Come. First Served. Last Chance! Do you love wine? Do you know others who love wine? Do you want to get to know others who love wine? If any or all, our Wine Lovers Weekend, Saturday October 13th through Sunday the 14th, is for you. Check-in for lunch. Take a Mimosa Pontoon Cruise. Attend Wine Seminars. Enjoy a Classic Wine and Cheese Social, Dinner, and a Bonfire with a live Guitarist. Get a good night’s sleep, as you’ll need it for the Guided hike Sunday morning. Our legendary breakfast buffet is included as well! Sound like the perfect weekend? You better act fast. First come, first served, better call now! Of course, if the weekend doesn’t work, you can enjoy fine wine any time, in our newly remodeled Wine Cellar!